Tämän PNG-esikatselun koko koskien SVG-tiedostoa: 800 × 566 kuvapistettä. Muut resoluutiot: 320 × 226 kuvapistettä | 640 × 453 kuvapistettä | 1 024 × 724 kuvapistettä | 1 280 × 905 kuvapistettä | 1 268 × 897 kuvapistettä. Apple's fiscal year ends in September. This means that Q1 includes the holiday season, which accounts for jumps in the data. Fiscal Q1 is Oct–Dec of previous year. So Q1 of 2008 is Oct–Dec of 2007, Q2 of 2008 is Jan–Mar of 2008 and so on. ↑ Apple Inc. (16 January 2002). Apple Reports First Quarter Profit of $38 Million. Press release. Retrieved on 2006-11-19. ↑ Apple Inc. (14 May 2002). Apple Investor Relations SEC Filings Quarter 2, 2002. Retrieved on 2006-11-19. ↑ a b Apple Inc. (12 August 2003). Apple Investor Relations SEC Filings Quarter 3, 2003. Retrieved on 2006-11-19. ↑ MacWorld (17 October 2003). Apple/Analysts on the iTunes Music Store, iPod. Retrieved on 2006-11-07. ↑ a b Apple Inc. (14 January 2004). Apple Reports First Quarter Results. Press release. Retrieved on 2006-05-25. ↑ Apple Inc. (13 May 2003). Apple Investor Relations SEC Filings Quarter 2, 2003. Retrieved on 2006-11-19. ↑ Apple Inc. (15 October 2003). Apple Reports Fourth Quarter Results. Press release. Retrieved on 2006-05-25. ↑ Apple Inc. (14 April 2004). Apple Reports Second Quarter Results. Press release. Retrieved on 2006-05-25. ↑ Apple Inc. (14 July 2004). Apple Reports Third Quarter Results. Press release. Retrieved on 2006-05-25. ↑ Apple Inc. (13 October 2004). Apple Reports Fourth Quarter Results. Press release. Retrieved on 2006-05-25. ↑ Apple Inc. (12 January 2005). Apple Reports First Quarter Results. Press release. Retrieved on 2006-05-25. ↑ Apple Inc. (13 April 2005). Apple Reports Second Quarter Results. Press release. Retrieved on 2006-05-25. ↑ Apple Inc. (13 July 2005). Apple Reports Third Quarter Results. Press release. Retrieved on 2006-05-25. ↑ Apple Inc. (11 October 2005). Apple Reports Fourth Quarter Results. Press release. Retrieved on 2006-05-25. ↑ Apple Inc. (18 January 2006). Apple Reports First Quarter Results. Press release. Retrieved on 2006-05-24. ↑ Apple Inc. (19 April 2006). Apple Reports Second Quarter Results. Press release. Retrieved on 2006-05-25. ↑ Apple Inc. (19 July 2006). Apple Reports Third Quarter Results. Press release. Retrieved on 2006-07-23. ↑ Apple Inc. (18 October 2006). Apple Reports Fourth Quarter Results. Press release. Retrieved on 2006-10-18. ↑ Apple Inc. (17 January 2007). Apple Reports 2007 First Quarter Results. Press release. Retrieved on 2007-01-17. ↑ Apple Inc. (25 April 2007). Apple Reports 2007 Second Quarter Results. Press release. Retrieved on 2007-04-25. ↑ Apple Inc. (25 July 2007). Apple Reports 2007 Third Quarter Results. Press release. Retrieved on 2007-07-25. ↑ Apple Inc. (22 October 2007). Apple Reports 2007 Fourth Quarter Results. Press release. Retrieved on 2007-10-22. ↑ Apple Inc. (22 January 2008). Apple Reports 2008 First Quarter Results. Press release. Retrieved on 2008-01-23. ↑ Apple Inc. (23 April 2008). Apple Reports Record 2008 Second Quarter Results. Press release. Retrieved on 2008-04-23. ↑ Apple Inc. (21 July 2008). Apple Reports Record 2008 Third Quarter Results. Press release. Retrieved on 2008-07-21. ↑ Apple Inc. (21 October 2008). Apple Reports 2008 Fourth Quarter Results. Press release. Retrieved on 2008-10-22. ↑ Apple Inc. (21 January 2009). Apple Reports 2009 First Quarter Results. Press release. Retrieved on 2009-01-21. ↑ Apple Inc. (22 April 2009). Apple Reports 2009 Second Quarter Results. Press release. Retrieved on 2009-06-15. ↑ Apple Inc. (21 July 2009). Apple Reports 2009 Third Quarter Results. Press release. Retrieved on 2009-07-21. ↑ Apple Inc. (25 January 2010). Apple Reports 2010 First Quarter Results. Press release. Retrieved on 2010-01-25. ↑ Apple Inc. (20 April 2010). Apple Reports 2010 Second Quarter Results. Press release. Retrieved on 2010-04-20. ↑ Apple Inc. (20 July 2010). Apple Reports 2010 Third Quarter Results. Press release. Retrieved on 2010-07-20. ↑ Apple Inc. (18 October 2010). Apple Reports 2010 Fourth Quarter Results. Press release. Retrieved on 2010-10-18. ↑ Apple Inc. (18 January 2011). Apple Reports 2011 First Quarter Results. Press release. Retrieved on 2011-01-18. ↑ Apple Inc. (20 April 2011). 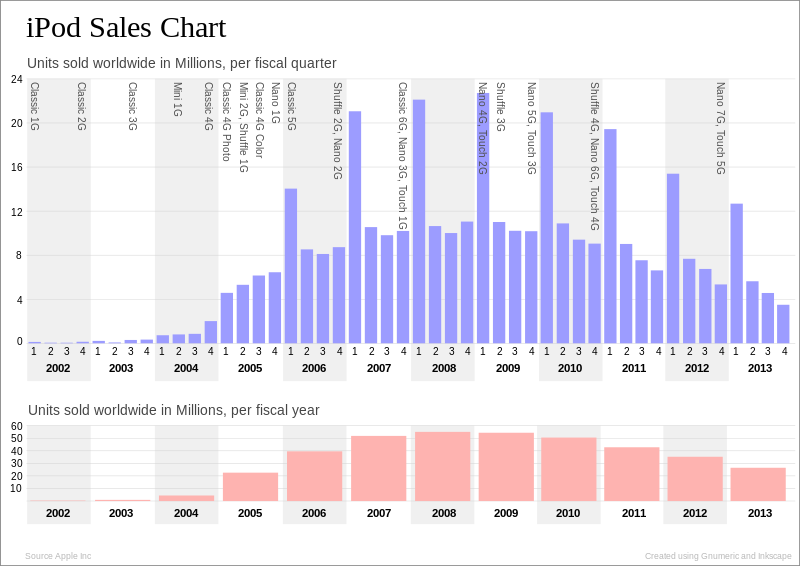 Apple Reports 2011 Second Quarter Results. Press release. Retrieved on 2011-04-20. ↑ Apple Inc. (19 July 2011). Apple Reports Third Quarter Results. Press release. Retrieved on 2011-08-08. ↑ Apple Inc. (18 October 2011). Apple Reports Fourth Quarter Results. Press release. Retrieved on 2011-10-18. ↑ Apple Inc. (24 January 2012). Apple Reports First Quarter Results. Press release. Retrieved on 2013-12-18. ↑ Apple Inc. (24 April 2012). Apple Reports Second Quarter Results. Press release. Retrieved on 2013-12-18. ↑ Apple Inc. (24 July 2012). Apple Reports Third Quarter Results. Press release. Retrieved on 2013-12-18. ↑ Apple Inc. (25 October 2012). Apple Reports Fourth Quarter Results. Press release. Retrieved on 2013-12-18. ↑ Apple Inc. (23 January 2013). Apple Reports Record Results. Press release. Retrieved on 2013-12-18. ↑ Apple Inc. (23 April 2013). Apple Reports Second Quarter Results. Press release. Retrieved on 2013-12-18. ↑ Apple Inc. (23 July 2012). Apple Reports Third Quarter Results. Press release. Retrieved on 2013-12-18. ↑ Apple Inc. (28 October 2012). Apple Reports Fourth Quarter Results. Press release. Retrieved on 2013-12-18. ↑ Apple Inc. (27 January 2014). Apple Reports First Quarter Results. Press release. Retrieved on 2013-12-18. ↑ Apple Inc. (23 April 2014). Apple Reports Second Quarter Results. Press release. Retrieved on 2013-12-18. ↑ Apple Inc. (22 July 2014). Apple Reports Third Quarter Results. Press release. Retrieved on 2013-12-18. ↑ Apple Inc. (20 October 2014). . Press release.